My daughter has been going to the Seattle Gay Pride parade for the past several years and has always really enjoyed it. I've never gone before and I decided that this year I would rectify that. After the Supreme Court decision last Friday and seeing the rainbows everywhere I decided that I needed to wear something special. 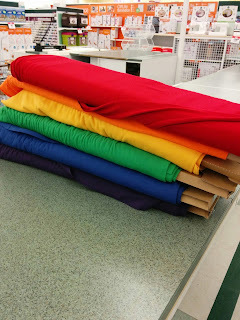 So on Saturday I went to JoAnn's and bought 1 yard each of the rainbow in knit. 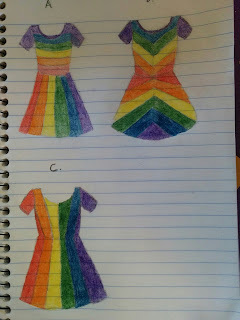 Then I went home, tossed my new fabric in the washing machine and sketched a few designs. My husband liked view A best, but I decided on C anyway. 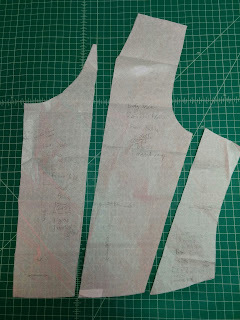 So, I took my TNT Kitschy Coo Lady Skater pattern and divided the skirt piece into 3 even pieces by measuring the waist seam and the hem and dividing by 3 and sewing a line between them. 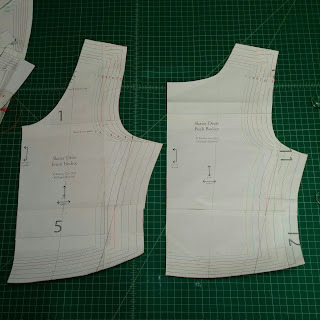 Then I took the bodice pieces and equally divided the waist seam by 3 and then referred to my sketch and eyeballed where I should put the other end of each dividing line and drew them in. I then traced each piece, adding a 3/8" seam allowance to each new seam line and to the center edge, since it's normally cut on the fold and will now have a seam too. 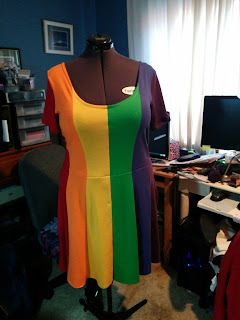 You may be able to see that I noted on each piece what colors that piece would be and I'm so glad I did that ahead of time because that's a lot of pieces to cut out. 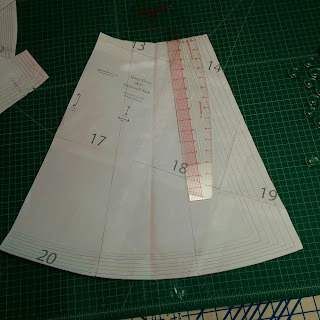 Once I had everything cut out, I just sewed each individual piece back together and then assembled the dress as usual. 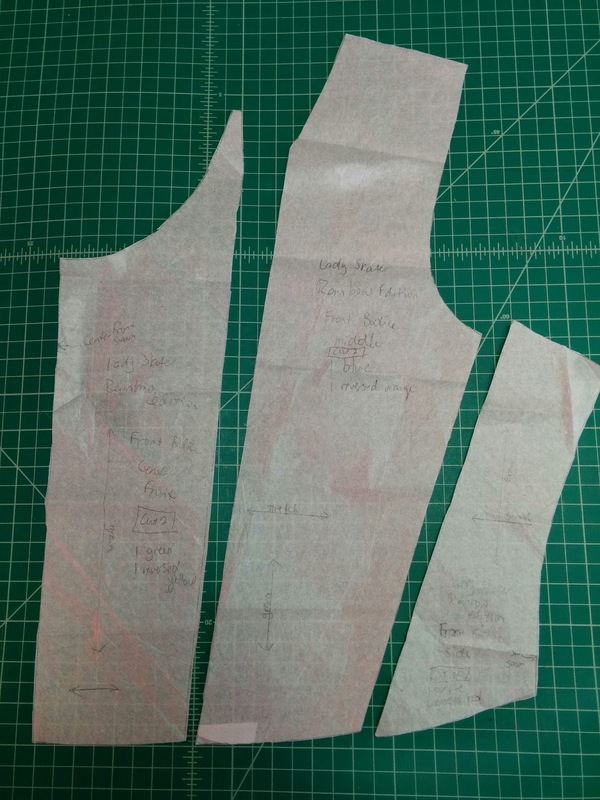 I added in seam pockets, as I do with all my lady skaters now (in fact I'm going to go back and put them in my first one.) 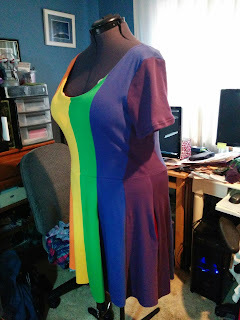 I cut one pocket lining out of the red and one out of the purple and as I was assembling the dress, I thought it would be fun to swap the linings so the red lining is on the purple side and vice versa. 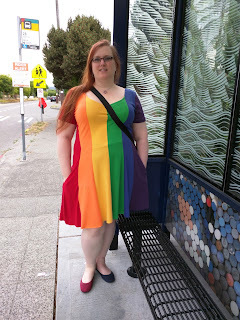 And here is the dress in action. I'm so very pleased with how it turned out. There are a few minor things that I'm not happy with. Since it was a last minute project, I was stuck with the fabric that I could find locally, so the red is a lot softer and thinner than the others and is the only one with a 4 way stretch, so that side of the dress just droops down a bit more. 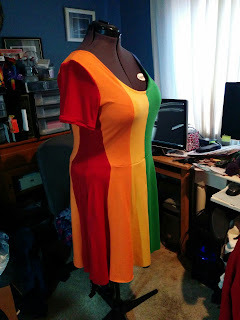 And the orange is the only one that has spandex in it, so the dress got bigger as the day went on. But overall, it's the dress I'm the most proud of so far. I love it! 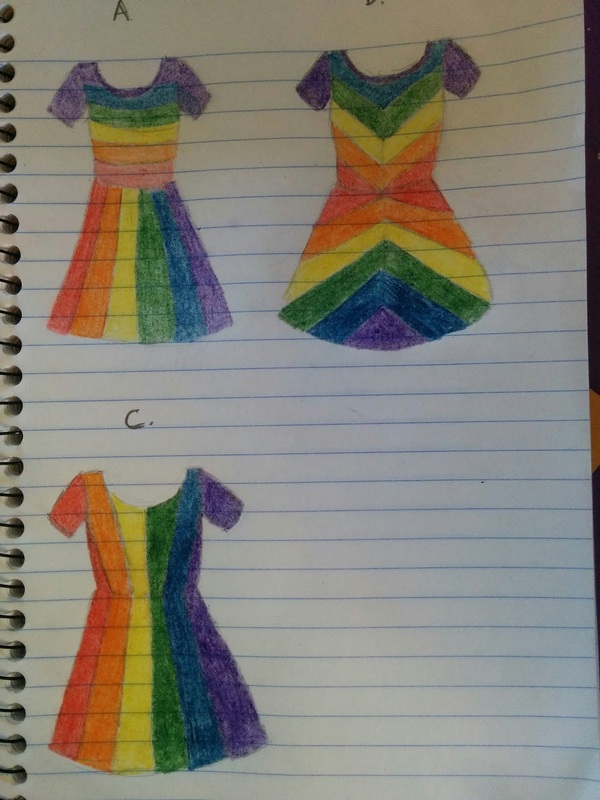 How clever and cute. Nice work! Super cute! What a fun thing to make, and wear. 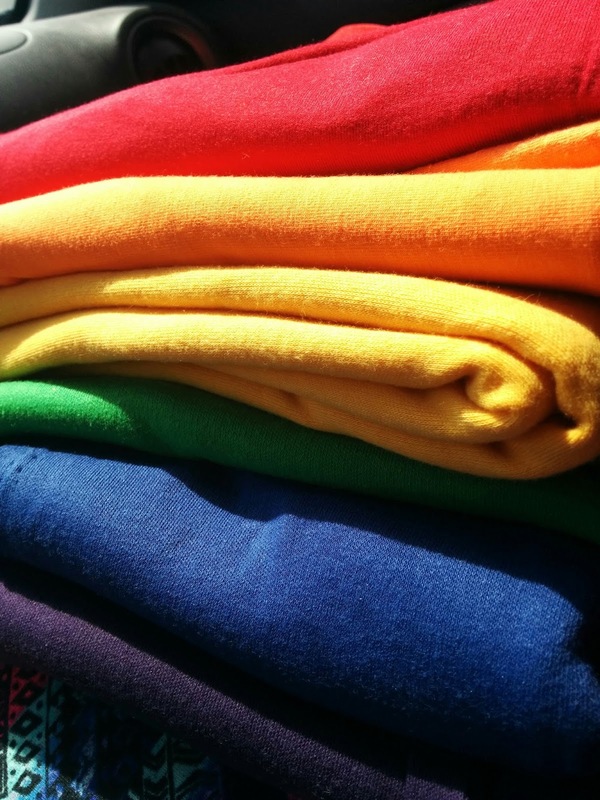 I love it and I think it suits you - you look great! This dress not only makes a statement, it looks great on you! 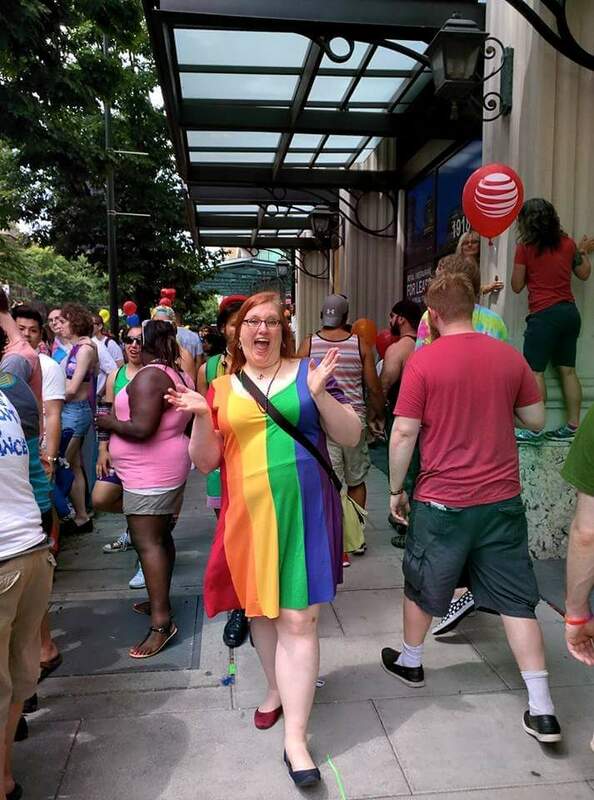 Kudos for style and fit!